Traffic queueing on the M62 between Tingley and Gildersome. 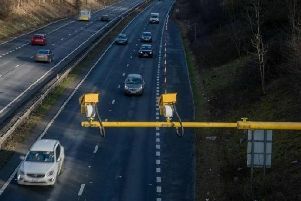 Here are the planned roadworks in Yorkshire and the Humber from today (Monday) to Sunday. The westbound exit slip road will be fully closed overnight on Wednesday 29 March for electrical works. The closures will take place between 8pm and 6am, and drivers will be able to follow clearly signed diversion routes. The southbound carriageway will be fully closed overnight for seven nights from Monday 27 March for carriageway repairs. The closures will take place between 8pm and 6am weekdays and 9pm and 10am weekends, and drivers will be able to follow clearly signed diversion routes. The anticlockwise exit slip road will be closed overnight on Wednesday 29 March for electrical works. The closures will take place between 8pm and 6am, and drivers will be able to follow clearly signed diversion routes. The southbound exit slip road will be closed overnight for three nights from Friday 31 March for bridge works. The closures will take place between 8pm and 6am, and drivers will be able to follow clearly signed diversion routes. The southbound exit slip road will be fully closed overnight for three nights from Monday 27 March for barrier works. The closures will take place between 9pm and 6am, and drivers will be able to follow clearly signed diversion routes. The carriageway will be fully closed overnight for seven nights from Monday 27 March for carriageway repairs. The closures will take place between 8pm and 6am weeknights and between 8pm and 10am at weekends, and drivers will be able to follow clearly-signed diversion routes. The eastbound carriageway will be fully closed between the slip roads overnight for five nights from Monday 27 March for carriageway repairs. The closures will take place between 9pm and 6am, and drivers will be able to follow clearly signed diversion routes. The eastbound and westbound carriageway will be fully closed overnight for four nights from Tuesday 28 March for carriageway repairs. The closures will take place between 8pm and 6am, and drivers will be able to follow clearly signed diversion routes. The northbound exit slip road at junction 34 will be closed overnight on Wednesday 29 March. The northbound carriageway at junction 33 will be closed overnight between the slip roads on Thursday 30 March. The northbound entry slip road at junction 33 will be closed overnight on Wednesday 29 March and then again on Friday 31 March. The southbound exit at junction 33 will be closed overnight on Friday 31 March. The southbound entry at junction 34 will be closed overnight for two nights from Thursday 30 March. The southbound carriageway will be closed between the slip roads at junction 32 overnight on Tuesday 28 March. The works are for the smart motorway scheme. The closures will take place between 8pm and 6am, and drivers will be able to follow clearly signed diversion routes.